Glenwood Springs Trains | Visit Glenwood Colorado Today! There was fierce competition between the Denver & Rio Grande Railroad (D&RG) and the Colorado Midland Railroad to be the first to serve the community of Glenwood Springs. 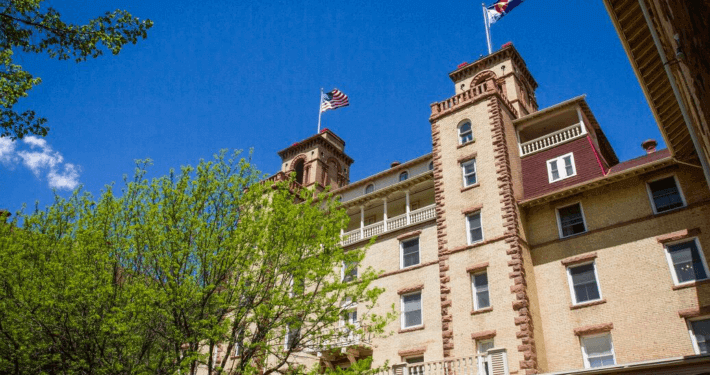 In the late 1880s, Glenwood Springs was booming. Walter Devereux was putting the finishing touches on his hot springs resort and was in the midst of building a hotel to rival the finest chateaus of Europe. Glenwood desperately needed train service to transport people and materials. Silver ore and coal from Glenwood and neighboring communities had to be hauled east. Farmers needed to get their agricultural products into the hands of buyers. A train would also enable visitors to easily reach Glenwood Springs. The first railroad to reach Glenwood Springs would score first dibs on the business. After two years of arduous construction and an estimated $2 million dollars, the D&RG arrived in Glenwood Springs on October 5, 1887. The completed rail route passed from Leadville over Tennessee Pass, through Glenwood Canyon to Glenwood Springs and onto Aspen. The Colorado Midland Railroad reached Glenwood on December 12, 1887. Its route originated in Colorado Springs, went through Leadville, over the Continental Divide, and down the Frying Pan River Valley to Basalt. It then built tracks to both Glenwood Springs and Aspen. The train depot on 7th Street opened in 1904. Due to the sharp decrease in business because of the Silver Panic of 1893, and the difficulty of keeping the tracks cleared on the high mountain passes during the winter months, the Colorado Midland Railroad declared bankruptcy in 1919. In 1908, the Denver & Rio Grande merged with Western Pacific Railroad to become the Denver & Rio Grande Western (D&RGW). A half century later, the D&RGW began offering luxury passenger service aboard an innovative railcar that provided riders with unimpeded views of the scenery. The California Zephyr with its Vista-Dome car named the Silver Dome made its inaugural pass through Glenwood Canyon in 1949. In fact, it was Glenwood Canyon’s spectacular scenery that inspired the design of Amtrak’s iconic Vista-Dome railcar. Although the Silver Dome has long been retired, visitors can still ride Amtrak’s California Zephyr with its Observation/Sightseer Lounge Car that features panoramic, floor-to-ceiling windows, ideal for viewing the breathtaking scenery of Glenwood Canyon. In 1984, oil tycoon and entrepreneur, Phillip Anschutz purchased the D&RGW. Under his direction, the D&RGW merged with the Southern Pacific Railroad in 1988. When the Southern Pacific merged with the Union Pacific in 1996, Anschutz exchanged his Southern Pacific stock for Union Pacific shares and became the UP’s second-largest shareholder.